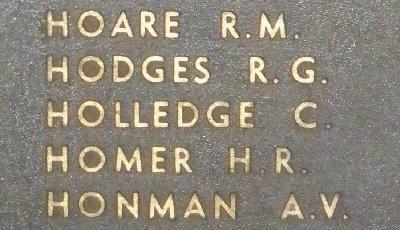 War Grave Register notes: HOLLEDGE, Pte. Charles, 467. 2nd Light Horse Field Amb. Australian Army Medical Corps. Killed in action 4th Aug., 1916. Age 31. Son of Louisa Cruickshank (formerly Holledge), of Uralla, New South Wales, and the late Robert Holledge. B. 24.